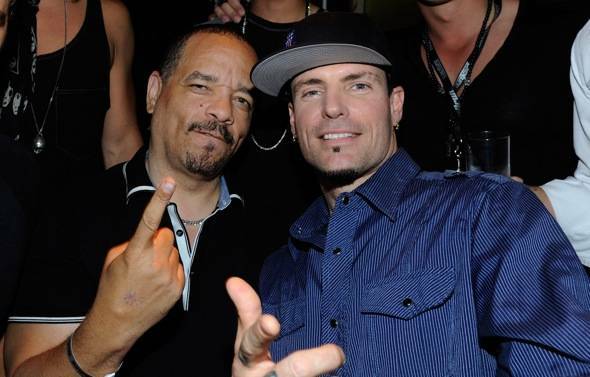 Ice-T and Vanilla Ice at Gallery Nightclub. Two lyrical legends, one blonde bombshell and a group of high-flying stuntmen took over Gallery Nightclub at Planet Hollywood Resort last night. Ice-T and his wife Coco, Vanilla Ice and The Dudesons held court at the new hot spot. The wild bunch was in town celebrating MTV’s “Bullrun” cross-country challenge, an event that brought in hundreds of contestants and fans to pack the deejay booth and VIP stage. The hottest new couple in reality television, Ice-T and Coco, dressed to impress in a skin-tight, hot pink mini dress, sipped on Grey Goose cocktails in between posing for photos with fans and dancing at their VIP table. Rapper Vanilla Ice enjoyed his time at Gallery by sipping on Grey Goose cocktails and throwing back shots of Jaegermeister. Fans went wild when they saw Vanilla Ice enter the club and swarmed his table hoping to catch a glimpse of the famed musical artist. Also spotted at Gallery last night was the popular stunt group, The Dudesons. 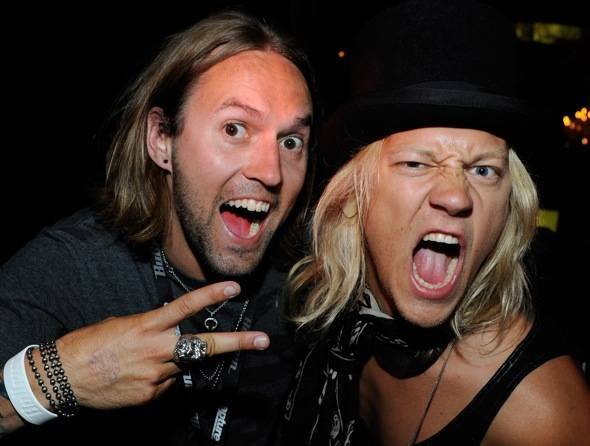 Best known for their MTV reality show “The Dudesons in America,” the pranksters set up shop in a plush VIP booth while drinking Grey Goose cocktails and taking shots of Jack Daniels. Television personalities Hannu-Pekka Parviainen (L) and Jukka Hilden of The Dudesons at Gallery Nightclub. Actor/rapper Ice-T (L) and Coco at Gallery Nightclub. Actor/rapper Ice-T, Coco and rapper Vanilla Ice.